Relationships after de Kloet and de Kloet 2005. Collar, N.J. 1997. Psittacidae (Parrots). Pages 280-477 in Handbook of the Birds of the World. J. del Hoyo, A. Elliott, and J. Sargatal, eds. BirdLife International and Lynx Editions, Cambridge, UK and Barcelona. Forshaw, J. M. 2006. Parrots of the World. Princeton University Press. Forshaw, J. and W. T. Cooper. 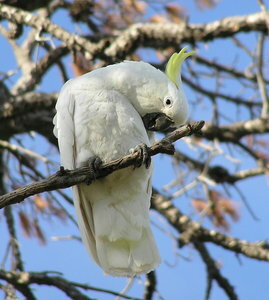 2002 Australian Parrots, 3rd edn. Robina Press, Queensland, Australia. Higgins, P. J. 1999 Handbook of Australian, New Zealand and Antarctic birds, vol. 4: Parrots to Dollarbird. Oxford University Press, Melbourne, Australia. Juniper, T. and M. Parr. 1998. 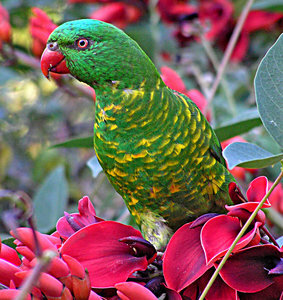 Parrots: A Guide to Parrots of the World. Yale University Press, New Haven. Miyaki, C. Y., S. R. Matioli, T. Burke, and A. Wajntal. 1998. Parrot evolution and paleogeographical events: mitochondrial DNA evidence. Molecular Biology and Evolution 15:544-551. Wright, T. F., E. E. Schirtzinger, T. Matsumoto, J. R. Eberhard, G. R. Graves, J. J. Sanchez, S. Capelli, H. Muller, J. Scharpegge, G. K. Chambers, and R. C. Fleischer. 2008. A multilocus molecular phylogeny of the parrots (Psittaciformes): Support for a Gondwanan origin during the Cretaceous. Molecular Biology and Evolution 25(10):2141-2156; doi:10.1093/molbev/msn160. Page: Tree of Life Psittaciformes. Psittacidae. Parrots, Cockatoos, Lories, Lorikeets. Authored by John Harshman. The TEXT of this page is licensed under the Creative Commons Attribution-NonCommercial License - Version 3.0. Note that images and other media featured on this page are each governed by their own license, and they may or may not be available for reuse. Click on an image or a media link to access the media data window, which provides the relevant licensing information. For the general terms and conditions of ToL material reuse and redistribution, please see the Tree of Life Copyright Policies.